For Jonny Evans is was mission accomplished as Northern Ireland kicked off their EURO 2020 qualifying campaign. Six points from two games and a goal to boot made it a perfect week for the Leicester City defender. 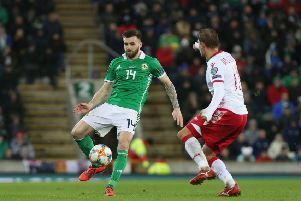 The results mean Northern Ireland top Group C ahead of the reverse fixtures with Estonia and Belarus in June, and Evans says they are determined to stay there. “That’s what we set out to do and it puts us on track in the group,” he said. “We now have two tough away games in June against the two teams we’ve just played but it’s a big opportunity for us to go into the games in September still top of the group. “I don’t think there’s any doubt we need to win the first four games in the group. “Listen, if we do draw or lose a game it won’t be the end of the world, but we’re playing Germany and Holland in the second half of the campaign. Evans knows June’s double-header on the road will bring its own challenges for boss Michael O’Neill. “It’s a tough time because the season ends for players at different stages,” he said. “I think some of the Estonian players might also be in season in June, so for Michael and the staff it’s a very difficult time to make sure all the lads are fit. As an experienced campaigner at international level Evans has been impressed with the next crop of players making their mark on the senior team. “I think you get confidence from every game you play,” he said. “After the Nations League, you might think some of their heads might have dropped because they were coming in when we didn’t get any victories in that competition. One player who Evans was really impressed with was Bailey Peacock-Farrell, who produced two crucial saves to make sure Northern Ireland took all six points. “Obviously he’s not playing at his club at the moment, but he’s come in and the last two games, I think he’s really come on massively,” said Evans. “You can even see in his stature, he seems even bigger and I was even more pleased to see him coming for crosses and knocking us defenders out of the way. “As a defender, we like it when goalkeepers come off their line and take the pressure off us.